It has got to be the best concert to start off the new year! Celebrating her aboriginal roots, A*mei shined through her alter-ego Amit, channelling a side of her that was never seen or heard before since she took to the Mandarin pop scene more than 10 years ago. Anyone who was hoping she would repeat her STAR World Tour Concert would definitely be disappointed. For one, it was less pop, and a lot of rock – even the music was deafening at some points! Secondly, there were less costume changes, and she really looked the part of a rock star! 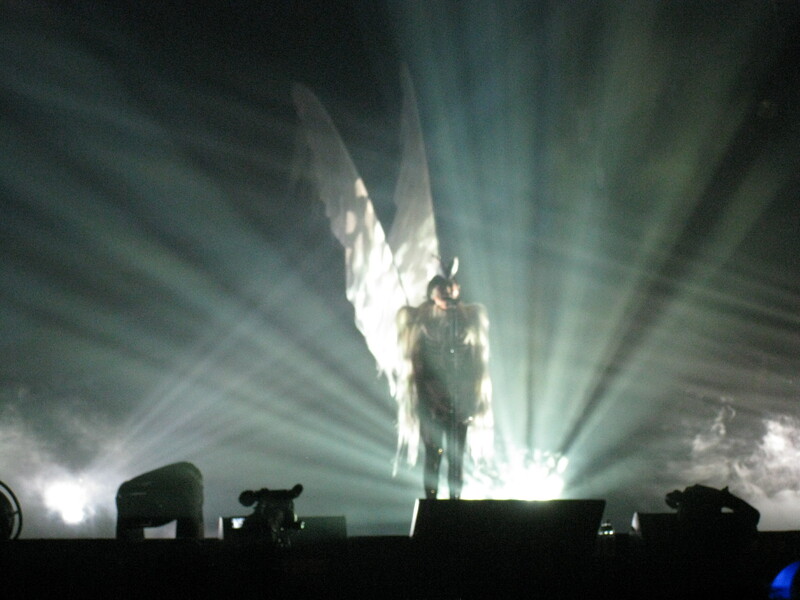 She kicked off the concert with 古调, an aboriginal composition whose lyrics were written by her mother, and appearing in a costume resembling a giant bird. It looks more intimidating rather than I am starting to like the song more and more, even though I have no idea what it really means. Alright I cannot remember the songs in sequence, only bits here and there. I am really surprised she sang songs that she has never sung in her previous concerts, some of which were really not the popular favourites that are streamed on radios every other hour, if they were at all. These included 冲动and 水蓝色眼泪 (from her debut album 姐妹)， 你好不好 and 发生什么事 (from her pre-Amit rock effort 爱是唯一), and 瞬间 (from her first album with Warner Music, 真实). I guess with more than 10 albums under her belt, it is definitely a headache to try an decide on a setlist for any of her concerts. I am glad I knew most of the songs! On the stage set, it was reminiscent of the F1 Rocks! concert that was held in conjunction with the F1 Race in Singapore last September I believe. I thought it was alright, but it could be better – for instance I thought there were too many panels, which resulted in distorted images in many cases. For me, the best moments were when the following songs were performed, because the stage visuals really worked with the songs: 相爱后动物感伤，灵魂的重量 and 掉了. The last two songs were stringed together one after the other, and I thought it was really the best moment of the night, even though the two songs were not exactly very rock, or rock. Definitely the most emotional part in the entire setlist! In addition to her own songs, she also covered Faye Wong’s 将爱, The Beatle’s Come Together, and Puccini’s aria from Turandot “Nessun Dorma”. I thought the way she sang Nessun Dorma was a bit scary though, though she did deliver it not too badly in the pop-rock way. By the way, she was also part of the Turandot cast in the Japanese production of the opera 2 years back. Musicians supporting her performance were brilliant as well. The band musicians were mainly Japanese, not sure why though, but they were totally amazing, especially the drummer! Oh, Marty Friedman performed on the lead guitar, and I thought he was just crazy (not that I know who he was before the concert happened)! Background vocalists include her aboriginal friends (whose names I conveniently forgot), and this singer from the group StyLe. Probably the best supporting vocal ensemble that has ever been assembled for a concert in my opinion! Just like in her other concerts, she had great rapport with the audience, maybe since most that turned up for the concert on Saturday were die-hard fans (including myself!! ); heard that the audience on Friday were not as enthusiastic. I seldom like to bob around in concerts but would rather sit comfortably in my seat until the last song or encore comes along, but I think I was standing up most of the time this time round. I am really looking forward to a DVD or even Blu-Ray release of the concert! After failing to release her Star Concert Tour on DVD because of some contractual thing with Warner Music, I do hope that this time round, her concert can finally be released on home video.